What is a Double Conversion or Online UPS? Double-conversion or Online technology continually converts incoming AC power into filtered DC power, and then re-converts it back into AC power with a pure sine wave. Constant on-line operation completely isolates sensitive equipment from every power problem on the AC line, with the reliable power protection of a traditional UPS. Why should I buy from RefurbUPS? Our difference is focus and our only business is power protection. We offer the "Best Value" for your APC power protection needs. With the widest in stock ready selection of Refurbished APC UPS's at low competitive prices. We can meet your most demanding power protection requirements, while delivering market leading UPS products priced for today's budget. Does RefurbUPS ship to Canada? Yes. All orders will be shipped via UPS Standard Service. Taxes, Duties, and Brokerage Fees may apply. For more information, please see our Canadian Order Details page. Should I connect a printer to my UPS unit? Printers draw a very large amount of power when in use and it is not advised that they be provided with UPS backup power because it is not economical. Many UPS's for desktop use surge protected only outlets that do not provide backup power. These surge only ports are where laser printers should be plugged in, since laser printers are plugged into outlets that do not use the UPS battery. If these surge only ports are not available on your UPS, consider using a power strip for the printer, directly plugged to a wall outlet. Why don't refurbished UPS units include serial cables or software? Why don't refurbished UPS units include rail mounting kits? In an effort to keep our offerings at low discounted prices, by request of our customers we do not include Rail Kits with Rack Mount UPS's. All Rack Mount UPS's do come with rack ears for mounting. If a four post rail kit is required for your UPS installation, they may be purchased separately from our accessories section. What is the difference between APC Smart-UPS SU models and APC Smart-UPS SUA models? AC Input and Output – Some VA models have different inputs and outputs then their counterpart in the other series. Communication ports – The SUA series has USB ports available. External Battery Packs – They are not cross compatible between series. Replacement Battery Kits – Models of the same VA rating but different series may need different battery replacement kits. What is the difference between APC Smart-UPS models and APC Smart-UPS NET models? The only difference between a SmartUPS and a SmartUPS Net unit is that the Net unit when purchased new, comes with the PowerChute software. In regards to Refurbished units, both are the same. RefurbUPS does not send out any additional software as it is a free download from APC’s website. What is the difference between APC Back-UPS models and APC Smart-UPS models? Which brands of UPS units do you carry? We supply both Factory New UPS units and Refurbished UPS units. Do you carry the batteries for my UPS? Follow the steps listed in How do I know which battery is right for my UPS? If you cannot locate your exact model number please contact us through live chat, phone call, or email. We are constantly adding replacement battery kits for more UPS Model Numbers. What is the difference between Volt Amp Ratings and Wattage Rating for a UPS unit? Introduction: This note helps explain the differences between Watts and VA and explains how the terms are correctly and incorrectly used in specifying power protection equipment. Many people are confused about the distinction between the Watt and Volt- Amp (V-A) measures for UPS load sizing. Background: The power drawn by computing equipment is expressed in Watts or Volt-Amps (VA). The power in Watts is the real power drawn by the equipment. Volt-Amps is called the "apparent power" and is the product of the voltage applied to the equipment times the current drawn by the equipment. Both Watt and VA ratings have a use and purpose. The Watt rating determines the actual power purchased from the utility company and the heat loading generated by the equipment. The VA rating is used for sizing wiring and circuit breakers. The power rating of the UPS: UPS have both Watt ratings and VA ratings. Neither the Watt nor the VA rating of a UPS may be exceeded. In most cases, UPS manufacturers only publish the VA rating of the UPS. However, it is a standard in the industry that the Watt rating is approximately 60% of the VA rating, this being the typical power factor of common loads. Therefore, it is safe to assume that the Watt rating of the UPS is 60% of the published VA rating. How to avoid sizing errors: Equipment nameplate ratings are often in VA, which makes it difficult to know the Watt ratings. If using equipment nameplate ratings for sizing, a user might configure a system which appears to be correctly sized based on VA ratings but actually exceeds the UPS Watt rating. By sizing the VA rating of a load to be no greater than 60% of the VA rating of the UPS, it is impossible to exceed the Watt rating of the UPS. Therefore, unless you have high certainty of the Watt ratings of the loads, the safest approach is to keep the sum of the load nameplate ratings below 60% of the UPS VA rating. Note that this conservative sizing approach will typically give rise to an oversized UPS and a larger run time than expected. If optimization of the system and an accurate run time are required, discuss your requirements with RefurbUPS Power protection representative, for product recommendations to meet your needs. Conclusion: Power consumption information on computer loads is often not specified in a way that allows simple sizing of a UPS. It is possible to configure systems that appear to be correctly sized but actually overload the UPS. By slightly over sizing the UPS compared with the nameplate ratings of the equipment, proper operation of the system is ensured. Over sizing also provides the side benefit of providing additional UPS backup time. Why do I need a UPS unit? A UPS unit is the life support system for your systems. It protects against the combined risks of data loss and hardware damage resulting from daily power fluctuations and losses. These events are routine and uncontrollable, and without a UPS can affect your operations and bottom-line costs. When does my UPS unit need new batteries? UPS batteries are typically rated for 3-5 years or 200 complete full-load discharge cycles assuming that the batteries have been maintained within manufacturer specifications. 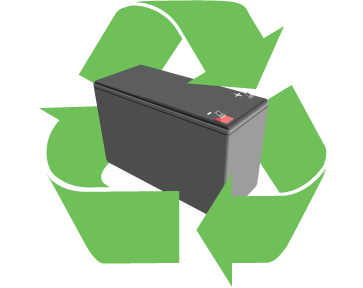 We recommend that UPS batteries be replaced every 2 to 3 years to ensure maximum performance in time of need. How do I select a proper sized UPS unit? Sizing a UPS for a PC or workstation can be simple. As with any electrical device, a computer has a rating plate that will give the power consumption, usually listed as "amps". In an effort to make this as easy as possible for our customers, we have created our own UPS Sizing Calculator (Click Here to Use) which will gather all of your required information and forward it to one of our protection specialists who will then be able to help you choose the best UPS for your situation. A UPS is sized by VA, or Volt Amps. To determine the VA, multiply the amps by the 120 (volts) to determine the VA (Volts x Amps = VA). Be sure to allow for at least a 20% growth factor. If you need further assistance with this, please feel free to contact us either via phone (866-883-9200), live chat, or email. Do I need software to run my UPS unit? For most UPS functions the answer is no. But remember, if a power outage lasts longer than the battery hold-up time, the UPS is only postponing the inevitable crash. For prolonged outages, a shutdown utility can be installed on the protected computer. This utility will communicate with the UPS and, after a set period of time which you determine, take control of the computer and shut it down gracefully, avoiding a system crash. Do you sell new UPS units? Yes. We offer a comprehensive line of Factory new UPS units. Click here to see our current available line of new UPS units. For a router/switch/firewall, which UPS unit would best suit my needs? You can use our UPS Sizing Calculator for Cisco Equipment to have one of our specialists help you choose the best UPS for your situation.